Shunts are used by battery monitors to measure battery state of charge. This shunt is typically used with Outback Radian inverter systems or anything else requiring a 10:1 shunt ratio. A shunt is a very precise resistor that will produce a low voltage drop (millivolts) proportional to the amount of current flowing through it. 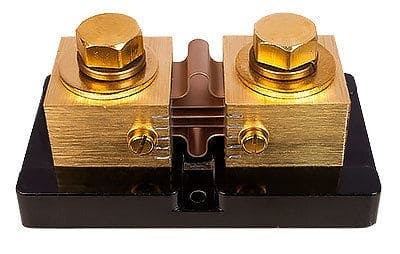 There are several different size shunts available depending on the maximum amperage of the circuit it will be installed in, and the amperage-to-millivolt drop ratio required by the particular meter you plan to use. For example, a 10:1 shunt will produce a 1 millivolt drop for every 10 amps of current that is flowing through it. Most meters that use an external shunt can be placed 50-100 feet away from the shunt.